I'm not quite sure exactly what it is about cats that makes me love them so. But I do love them, from their pointy ears and long whiskers to the tips of their tails. I love their dainty feet (even the polydactyls manage to appear dainty) and that ever-so-soft bit of fur at the base of their ears. Plush tummies, sandpaper tongues, the sound of contented purring...it all makes me happy. Yes, I am a cat person. Therefore, it comes as no surprise that I regularly visit certain sites that celebrate cats in all their glory. I thought I'd share them. First there is Stuff On My Cat. I visit several times a day, time permitting. This blog posts a picture every hour of a cat with something on it, or sometimes, a picture under the heading, "My Cat On Stuff." I've submitted several pictures of Millie, with no luck as yet. Don't worry, no kitties are harmed in the making of the pictures--the site is maintained by and contributed to by genuine cat lovers. Every day at 3:07 pm, Greenwich Mean Time (that would be 7:07 in the morning for West Coasters, so just as I'm having breakfast and checking my email), the site master of The Daily Kitten posts, you guessed it, the daily kitten picture. Only one picture per day, and sometimes the picture contains more than one kitty. A lovely way to start the morning. Linked to The Daily Kitten is a site called the Random Kitten Generator. It's a simple premise. You can "ooh" and "ahh" over the picture, then click on the button to get another one. As Heather said, "It's kitten crack!" So true, so true. I find it is the perfect balm for a bad day...and that it is extremely hard to stop clicking. A few days ago, Dad emailed me the link to a hysterical YouTube video, Wake Up Cat. The cartoonist who created this obviously knows cats very well. The cat's voice cracks me up, as do his facial expressions. After viewing this, I did some searching on YouTube and found Silly Kittens. Anyone who has ever had a kitty-vs.-toilet paper experience (as I have) can relate to this one. These links and videos always make me laugh, but they are, of course, no substitute for the real thing. I have my very own Cutie Patootie to cuddle with. She is definitely very important to me. 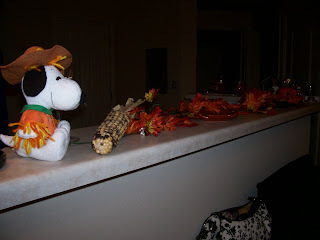 I love this time of year...the temperatures cool down, the leaves turn. The air is crisper, and even sunny days require a sweater. 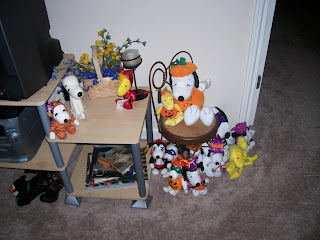 Some Halloweenie stuff on top of the computer hutch. Farmer Snoopy overlooking some corn and silk leaves. 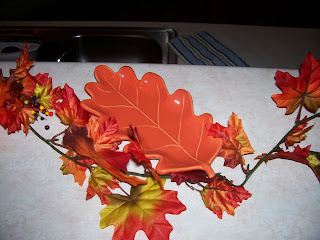 A little leaf plate (one of three). 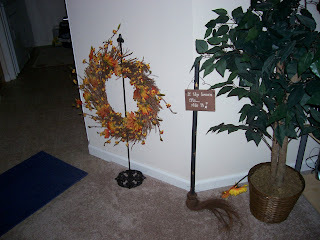 A fall wreath and my broomstick. Thursday night I was sneezing like crazy. Figured it was allergies. Friday morning I woke up with the worst stuffed head imaginable. Even after meds and a shower, I was not up to going to work. I threw on some jeans, my favorite London hoodie and a hat, ran my lesson plans to school, and then came home to crash on the sofa with a book. I had a two+ hour nap. You get the picture. Yesterday I had to spend my day supervising a car wash...with no support from the parents, but that complaint is another story for another day. 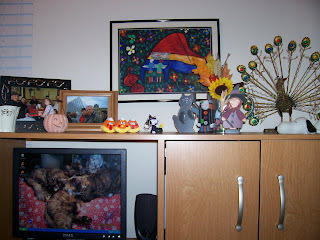 When I came home, I did a little bit of cleaning--okay, okay, I admit it. I swept and mopped the kitchen, laundry room and bathroom, cleaned all counters, and did some major organizing. It needed to be done! I gave myself an 8:00 cut-off, at which time I was to shower and then sit down with my new Grey's Anatomy Season 3 DVD set. Only problem? I had washed the mattress pad from my bed, but not my sheets. Those were in a heap on the floor. 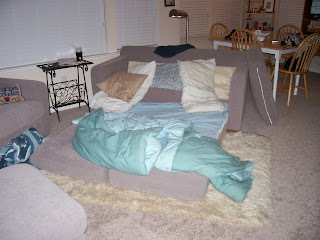 Then I had a bright idea: Sleep on my fold-out sofa! I dragged it out, piled on the pillows and my comforter, and settled in for four hours of Grey's. When I was finished, all I had to do was turn off the TV. Brilliant! The fold-out is actually quite comfortable. I got a good eight hours of sleep. I still prefer my bed, but for a Saturday night Grey's-fest, this wasn't a bad idea. A few weeks ago, I went off of my anti-depressant medication. I was so very proud of myself--things were definitely looking up for me and I was handling any stresses I encountered very well. On Tuesday of this week, I suffered a big set-back. One "off" day and one long parent/student conference later, and I was a crumbling wreck. I called Mom and Dad that evening, barely able to speak around my sobbing. There went the pride I felt in how well I was handling everything. Wednesday was better, and Thursday was absolutely fine. Today I didn't go to work, as I have some kind of cold/flu/sinus infection. I woke up feeling pretty rough. Good spirits, awful stuffed head. I've spent most of the day alternating between reading on the sofa and taking a three-hour nap in my bed. A few minutes ago, I shuffled down to the mail box (allll the way at the other end of my apartment complex) to get the mail, in the hopes that Season 3 of Gray's Anatomy would be waiting for me. It was. So was an envelope from Dad containing a check to pay me back for purchasing "The War" for him on Amazon. Curiously, there was also another envelope from him. It was slightly torn and some sort of metal jewelry was sticking out. These guys flew some North Vietnam missions with me back in the '60's. The dog tag has my old serial # o nit. The serial # was discontinued in 1970 and replaced with social security #s. The can opener was used to open the K rations. Since nobody killed me while I carried them, I thought they might protect you from the slings and barbs. I'm proud of you. Keep up the good fight. Needless to say, I'm sitting here crying--the good tears--as I write this.